Food grade, repeatedly autoclavable, odourless, non-toxic, high temperature resistant. Our company is dedicated to serve our clients with an excellent quality Silicone Tri Clover Gaskets. With the best machine technology being installed at our company premises, our company offers a supreme series of Silicone Tri Clover Gaskets which come at a very economical market rate. We provide excellent varieties of Filter Rubber Gasket to our esteemed clients. Products offered by us are highly appreciated among the customers for their better efficiency, optimum strength and excellent functioning in extreme conditions. These gaskets are composed from food grade silicone rubber. It has high temperature resistance. Our range also made available in various shapes and designs. Hi-Tech Polymers manufacturing Silicone T.C. Gasket. - Confirms to FDA21CFR 177-2600 & USP class VI requirements. - Silicone Tri-clover Gaskets manufactured from Food/MedicalGrade 100% Silicone Rubber. - Shore Hardness 70 + 5 shores as per customers require. - Test Certificate are available of Govt. recognized lab for Food Grade MOC. We manufacture Silicone Tri Clover Gasket in 100% pure silicone Transparent Rubber with collar and without collar. 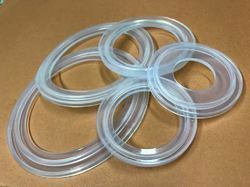 We are a well-known organization that is engaged in manufacturing, supplying and Exporting a vast array of Silicone Triclover Gasket. Our product range is wide and comprehensive, owing to our sophisticated production unit and diligent group of professionals. Our vendors ensures that we use quality raw materials in the production process of Silicone Triclover Gasket.